When your impact is too big to create and sustain alone. 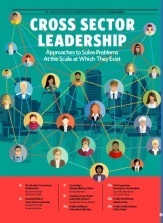 The complex, emergent and interdependent challenges we face require transformative and collaborative leaders. Join us in a community of practice as we explore the research, resources and rich stories of cross sector leadership. Are you a business leader who feels called to use the fast-paced, iterative and scalable resources at your disposal to make a difference beyond merely the bottom line for your business? Are you a nonprofit leader who wants to utilize your programmatic experience and community connections but is also committed to broader systemic and scalable change than might be possible solely with your organization’s programs? Are you a philanthropic leader who is exploring ways of fostering system level change by moving beyond funding individual programs and individual organizations to funding systems change? Or are you a government leader who sees the big picture and is looking to use government resources to combine programs into scalable initiatives that can meet problems at the scale at which they exist? If you said “yes” to any of these questions, there is a role for you as a cross sector leader.